Rhino poaching has become an ever increasing problem over the past few years. Since 2008 cases of rhino poaching, especially in South Africa which contains 80% of all of Africa’s rhinos, have increased dramatically. 2011 saw 448 cases of poaching in South Africa, indicating an increase of 3000% since 2007. 668 rhinos were killed in the country in 2012 and the number is set to be even higher for this year. This is obviously devastating news for the rhinos of Africa, especially black rhinos, which are already critically endangered in the wild. If poaching on this scale continues, we face the devastating prospect that rhinos could become extinct in the wild within a matter of years. But why have cases of poaching escalated so much recently? Since 2007, demand for rhino horn has increased dramatically in South East Asia, especially in Thailand, China and Vietnam. Although made entirely of keratin with no medical benefits whatsoever, rhino horn is traded as a powder on the Asian medicine market and is used to treat everything from hangovers and fevers to strokes and even cancer. It is increasingly seen as a product symbolising prosperity and wealth, so demand is especially high among the middle and upper classes. It is therefore no wonder why poaching is such a lucrative business – it can fetch over US$60,000 per kg on the Asian market, which is more than the price of gold. This has caused greater intensification of the search for rhinos since 2007 according to Dr Joseph Okori, head of WWF’s African Rhino Programme. Poaching gangs are becoming progressively more organised, with some even using night vision equipment and helicopters to locate rhinos and escape in minimal time to avoid being caught. Poachers are always armed, so stopping them is made all the more dangerous and difficult. In order to save both black and white rhinos from extinction, cases of rhino poaching must be drastically reduced. 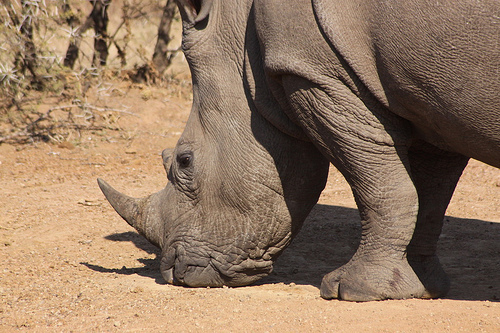 South African national parks and game reserves are often guarded to prevent poachers from illegally trespassing and hunting rhinos, but this is no longer enough. For example, Kruger National Park has experienced a 50% reduction in rhino numbers since 2010 due to poaching. This has been exacerbated by the merging of Kruger with other national parks to form the ‘Great Limpopo Transfrontier Park’, which was intended to increase species numbers and biodiversity by making a suitable habitat more readily available. However, when the park was created, fences were dropped at the boundary between Kruger and Mozambique, a country which has more relaxed laws on poaching. The creation of the Transfrontier Park has therefore contributed to the high rate of poaching in Kruger, where 257 rhinos have been killed so far in this year alone, due to poachers moving in from Mozambique where security is not so tight. Currently, South Africa is in discussions with Mozambique to re-erect the border, as Mozambique are not contributing equally to the laws and efforts put in by South Africa to prevent poaching. Subsequently, as armed guards are no longer enough to prevent the threat of poaching, more novel ideas are being tested and implemented. In a project coordinated by the Endangered Wildlife Trust, a small drone called ‘The Falcon’, invented by American Chris Miser, has been tested this May in the Limpopo mountains. It uses infra-red cameras to detect poachers, and is programmed to fly over areas of high rhino activity. Each drone will cost US$23,000 to make and run; which is around the annual cost of a ranger’s salary, and will do the equivalent job of 10 rangers on the ground, according to the project team. The near future may therefore see more of these small, battery-powered drone planes in action over South Africa’s reserves and parks. A method of preventing poaching which is much more controversial than the use of drones has recently been developed by a group called ‘The Rhino Rescue Project’. Dr. Charles van Niekerk, a wildlife vet, has developed a device which uses high pressure to infuse the keratin of a rhino’s horn with a bright pink dye. This dye is visible on x-ray scanners, meaning the horn can be detected in airport security and cannot be used for ornamental purposes. The dye would also hopefully discourage buyers from using the horn medically. This means that rhino horns can basically be rendered useless for poachers, whilst not affecting the animal at all, as the dye cannot be seen externally and is harmless. At the same time as implementing the dye treatment, rhinos are microchipped to keep track of numbers, and often ectoparasiticides are administered, which improve the rhino’s health by reducing risk of parasite infestations such as ticks. The controversy of this treatment is down to the fact that ectoparasiticides cause severe vomiting and illness if ingested by humans. If a treated rhino horn is still sold on by poachers, buyers in South East Asia could be dangerously affected without proper knowledge as to why. Moreover, the treatment grows out with the horn, so after four years it has to be re-administered. The Rhino Rescue Project can therefore only be a short-term solution to the poaching crisis, and is potentially dangerous to human health. Other projects are now being implemented which target the buyers of rhino horn, rather than the poachers themselves. If the people of China, Thailand and Vietnam could be properly educated on the devastating impacts of rhino poaching, and the fact that the horn they purchase is in fact totally useless, it would reduce demand for horn and therefore the amount of poaching. The WWF for example have produced an interactive phone game called ‘Rhino Raid’, which “represents a novel approach to the challenge of effective communication around rhino issues”, according to Dr Morné du Plessis, CEO of WWF-SA. Another novel way of communicating to buyers was started by the ‘Stop Rhino Poaching’ charity, which recently designed postage stamps with horrific images of poached rhinos on them and the words “say no to rhino horn” written in Chinese, Thai or Vietnamese. A campaign was started in South Africa which encouraged people to send letters to South East Asia with these stamps on them, so the message could be communicated at an individual level. The success of the above strategies to prevent rhino poaching, whether they target poaching directly, or indirectly by dissuading the target market of rhino horn, remains to be seen. The hope is that by increasing such efforts, poaching can be reduced and maybe one day stopped altogether before the beautiful and majestic rhinoceros becomes completely extinct in the wild.